The Magic of Motherhood celebrates your life as a mom—the good stuff, the hard stuff, and everything in between. From the writers behind the popular blog Coffee + Crumbs comes a beautiful new book to remind you of your identity, both as a woman and as a mother. Motherhood can often feel overwhelming and isolating. You find your feelings swinging between joy and uncertainty, intense love and anxiety, laughter and tears. Through it all, you constantly ask yourself, “Am I the only one who feels this way?” The Magic of Motherhood will reassure you that you’re not alone. 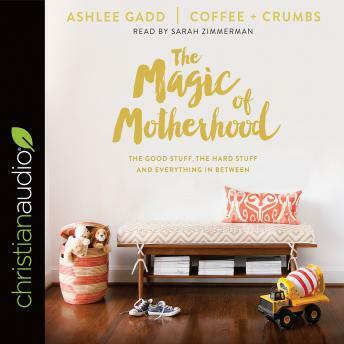 Full of encouragement, humor, and wisdom that will speak to you right where you are, The Magic of Motherhood is like a long-overdue coffee date with your best girlfriend. In this book you’ll find heartwarming essays about identity, adoption, body image, miscarriage, friendship, faith, infertility, and more. The Magic of Motherhood is a curated collection of honest stories that weave together the love, joy, and magnificent heartache of motherhood. Instead of offering advice, the writers offer something even better: their hearts. The Magic of Motherhood is a love letter to mothers everywhere; it’s a story about the magic that happens in between calm and chaos, the joy that can be found in both beauty and mess, and the valuable lessons we learn about ourselves in between cups of reheated coffee and kitchen tables covered in crumbs. Find a new strength, beauty, and sisterhood you never believed possible in The Magic of Motherhood, an inspiring and encouraging book written for an imperfect, trying-her-best mom just like you.